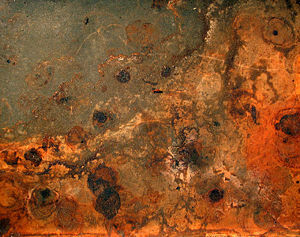 Corrosion is the deterioration of a material's essential properties as a result of reactions with its environment. It can be concentrated locally to form a pit or crack, or it can extend across a wide area to produce general deterioration. Many materials corrode merely upon exposure to air, moisture, and sunlight, but the process can be accelerated by exposure to certain chemicals. A substance that causes corrosion is called a corrosive substance, or simply, a corrosive. A corrosive can damage living tissue as well as inanimate materials. The rusting of iron is a well-known example of corrosion. Other metals may be similarly damaged, typically producing their oxides, hydroxides, and salts. Corrosion also refers to the dissolution of ceramic materials or the discoloration and weakening of polymers, such as by exposure to ultraviolet light from the Sun. Corrosion of a material can be controlled by applying a coating, such as by electroplating or painting, or by specialized techniques such as anodization or cathodic protection. The annual cost of corrosion has been estimated to be on the order of hundreds of billions of dollars in the United States alone. 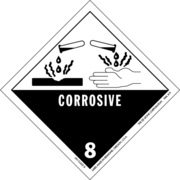 Warning symbol for a corrosive. Corrosive chemicals can be solids, liquids, or gases, and they can belong to any of several classes of materials. The following are some examples. Some organic materials, such as phenol ("carbolic acid"). Most ceramic materials are nearly immune to corrosion. Their atoms are bound together by strong ionic or covalent bonds that resist disruption. When corrosion does occur, it is almost always a simple dissolution of the material or a chemical reaction. By contrast, the corrosion of metals is an electrochemical process, as discussed below. A common example of corrosion protection in ceramics is the lime (calcium oxide) added to soda-lime glass to reduce its solubility in water. Though it is not nearly as soluble as pure sodium silicate, normal glass forms submicroscopic flaws when exposed to moisture. Given the brittleness of glass, such flaws dramatically reduce the strength of a glass object during its first few hours at room temperature. In the case of polymeric materials, their degradation can be caused by any of a wide array of complex and often poorly understood physicochemical processes. These are strikingly different from the other processes discussed below, so the term "corrosion" is applied to them in just a loose sense of the word. Given their high molecular weight, polymers are generally quite difficult to dissolve. In those instances where dissolution is a problem, it is relatively simple to design against. A more common and related problem is "swelling," in which small molecules infiltrate the structure, reducing strength and stiffness and causing a volume change. Conversely, many polymers (notably flexible vinyl) are intentionally swollen with plasticizers, and when these get leached out, the structure becomes brittle or undergoes other undesirable changes. The most common form of degradation of polymers is a decrease in chain length. In the case of DNA, agents that break their chains include ionizing radiation (most commonly ultraviolet light), free radicals, and oxidizers (such as oxygen, ozone, and chlorine). Additives can slow these processes effectively, and they can be as simple as a UV-absorbing pigment (such as titanium dioxide or carbon black). Plastic shopping bags often do not include these additives, so they can break down more easily as litter. Consider a metal in contact with an electrolyte—that is, a medium that can conduct electricity by allowing the flow of ions. Corrosion of the metal involves electrochemical changes. In other words, the metal is chemically changed by a process that involves the flow of an electric current, by the movement of electrons and ions. A good example is the rusting of iron or steel. When iron comes in contact with water (especially water with a high concentration of ions), an electrochemical corrosion process begins. This process can be summarized as follows. The electrons released travel to the edges of the water droplet, where there is plenty of dissolved oxygen. They combine with the oxygen and water to form hydroxide ions (OH−). If two metals are placed in an electrolyte (such as aerated seawater) and electrically connected, one metal will be more "active" while the other will be more "noble" (less active). The more active metal will experience what is called "galvanic corrosion." The activity of the metals is based on how strongly their ions are bound to their surfaces. When the two metals are in electrical contact, they share the same electron gas, so that the tug-of-war at each surface is translated into a competition for free electrons between the two materials. The noble metal tends to take electrons from the active one, and the electrolyte facilitates the flow of electricity by hosting a flow of ions. Based on the relative activity of metals within a given environment, they can be arranged in a hierarchy known as a galvanic series. This series can be a useful guideline for choosing materials for electrochemical processes. Some metals are intrinsically more resistant to corrosion than others, based on the fundamental nature of the electrochemical processes involved or the manner in which the reaction products are formed. 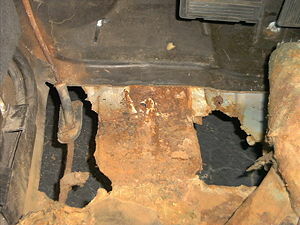 If a material is susceptible to corrosion, it may be protected from damage by various techniques. The materials most resistant to corrosion are those for which corrosion is thermodynamically unfavorable. 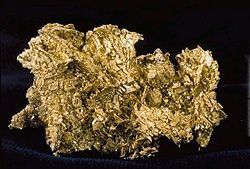 For example, corrosion products of gold or platinum tend to decompose spontaneously into the corresponding pure metal. These elements, therefore, can be found in metallic form in nature, and their resistance to corrosion is a large part of their intrinsic value. By contrast, the more common "base" metals can be protected in ways that are more temporary. For some metals, their corrosion may be thermodynamically favorable, but the rate of reaction is acceptably slow. Examples of such metals are zinc, magnesium, and cadmium. In the case of graphite, it releases large amounts of energy upon oxidation, but the reaction rate is so slow that it is effectively immune to electrochemical corrosion under normal conditions. For some metals (and metalloids) under appropriate conditions, a thin film of a hard, corrosion product forms spontaneously on the metal's surface, acting as a barrier to further oxidation. This protective film is usually an oxide or nitride of the metal. If this layer stops growing after reaching a thickness of less than one micrometer (under the conditions in which the material will be used), the phenomenon is known as passivation. This effect serves as an indirect kinetic barrier: The reaction is often quite rapid until an impermeable layer is formed. Passivation can be observed with materials such as aluminum, magnesium, copper, stainless steel, titanium, and silicon, when they are exposed to air and water at moderate pH. By contrast, the rusting of iron, which involves the formation of mixed oxides, is not considered passivation because the layer is not protective and usually grows to be much thicker. Conditions required for passivation are specific to each material. Some conditions that inhibit passivation include high pH for aluminum, low pH or the presence of chloride ions for stainless steel, high temperature for titanium (in which case the oxide dissolves into the metal), and fluoride ions for silicon. On the other hand, sometimes unusual conditions can bring on passivation in materials that are normally unprotected, as the alkaline environment of concrete does for steel rebar. Exposure to a liquid metal such as mercury or hot solder can often circumvent passivation mechanisms. The most common anti-corrosion treatments are electroplating, painting, and the application of enamel. They function by providing a barrier of corrosion-resistant material between the damaging environment and the (often cheaper, tougher, or easier-to-process) structural material. Aside from cosmetic and manufacturing issues, there are tradeoffs in mechanical flexibility versus resistance to abrasion and high temperature. Platings usually fail only in small sections, and if the plating is more noble than the substrate (such as chromium on steel), a galvanic couple will cause any exposed area to corrode much more rapidly than an unplated surface would. For this reason, it is often wise to plate with a more active metal, such as zinc or cadmium. If the environment is controlled, corrosion inhibitors can often be added to it. These inhibitors form an electrically insulating or chemically impermeable coating on exposed metal surfaces, thereby suppressing electrochemical reactions. Such methods make the system less sensitive to scratches or defects in the coating. Chemicals that inhibit corrosion include some of the salts in hard water, chromates, phosphates, and a wide range of chemicals that are designed to resemble surfactants (long-chain organic molecules with ionic end groups). 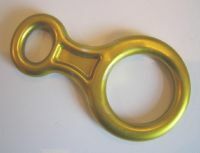 This figure-8 descender, used in rock climbing, is anodized with a yellow finish. Climbing equipment is available in a wide range of anodized colors. Items made with aluminum or its alloys are often given a surface treatment known as anodization in a chemical bath toward the end of the manufacturing process. Through this process, the existing layer of aluminum oxide on the object's surface is made thicker. The aluminum object is made to function as the anode (positively charged electrode) within an electrochemical cell, with an acid solution (usually sulfuric acid in water) serving as the electrolyte. When an electric current (direct current) is passed, the water breaks down (to hydrogen and oxygen), and oxygen at the anode combines with the aluminum to form aluminum oxide. The acid in solution reacts with the oxide, causing it to become a porous film. Electrochemical conditions in the bath are carefully adjusted so that uniform pores several nanometers wide appear in the metal's oxide film. These pores allow the oxide to grow much thicker than passivating conditions would allow. At the end of the treatment, the pores are allowed to close, forming a harder-than-usual (and therefore more protective) surface layer. If this coating is scratched, normal passivation processes take over to protect the damaged area. Cathodic protection (CP) is a technique to control the corrosion of a metal surface by making that surface the cathode (negative electrode) of an electrochemical cell. This technique is most commonly used to protect steel pipelines and tanks (for water and fuels), steel pier piles, ships, and offshore oil platforms. 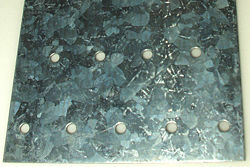 In this technique, the steel surface is given a uniform, negative electrical potential relative to another material that acts as the anode. With the flow of current, the corrosion of steel is halted, while the anode material corrodes and must be replaced eventually. For larger structures, galvanic anodes cannot economically deliver enough current to provide complete protection. Impressed Current Cathodic Protection (ICCP) systems use anodes connected to a direct-current power source (a cathodic protection rectifier). Anodes for ICCP systems are tubular and solid rods of various specialized materials, such as high-silicon cast iron, graphite, mixed metal oxide, or platinum-coated titanium. Passivation is extremely useful in alleviating corrosion damage, but one must be careful not to trust it too thoroughly. Even a high-quality alloy will corrode if its ability to form a passivating film is compromised. The modes of corrosion may be more exotic and their immediate results less visible than rust and other bulk forms of corrosion. Consequently, they may escape detection and cause problems. Pitting is among the most common and damaging forms of corrosion in passivated alloys. In the worst case, almost the entire surface remains protected, but tiny local fluctuations degrade the oxide film at a few critical points. Corrosion at these points can be greatly amplified, causing corrosion pits of several types, depending on conditions in the environment. Some conditions—such as low availability of oxygen or high concentrations of anions (for example, chloride ions)—can interfere with a given alloy's ability to re-form a passivating film. Although corrosion pits may begin to be formed under unusual circumstances, they can continue to grow even when conditions return to normal, because the interior of each pit is naturally deprived of oxygen. In extreme cases, the sharp tips of long, narrow pits can cause stress concentration to the point that otherwise tough alloys may shatter. Alternatively, a thin film pierced by an invisibly small hole may hide a thumb-sized pit from view. These problems are especially dangerous because they are difficult to detect before failure of the structure or its part. Pitting can be prevented by controlling the alloy's environment. This approach often includes ensuring that the material is exposed to oxygen uniformly (with the elimination of crevices). Many useful passivating oxides are also effective abrasives, particularly titanium dioxide (TiO2) and alumina (Al2O3). Fretting corrosion occurs when particles of corrosion product continuously abrade away the passivating film, as two metal surfaces are rubbed together. Although this process often damages the frets of musical instruments, they were named separately. Stainless steel can pose special corrosion challenges, because its passivating behavior relies on the presence of a minor alloying component (chromium, typically only 18 percent). During the elevated temperatures of welding or during improper heat treatment, chromium carbides can form in the grain boundaries of stainless steel alloys. This chemical reaction robs the material of chromium at the grain boundaries, making those areas much less resistant to corrosion. In highly corrosive environments, the result is "weld decay," that is, corrosion of the grain boundaries near welds. Special alloys, with low carbon content or with added carbon "getters"—such as titanium and niobium—can prevent this effect. If carbon getters are used, the alloy requires special heat treatment after welding to prevent the phenomenon of "knifeline attack." As its name implies, this type of corrosion is limited to a small zone, often only a few micrometers across, causing it to proceed more rapidly. This zone is very near the weld, making it less noticeable (Jones, 1996). Microbial (or bacterial) corrosion is that caused or promoted by microorganisms, usually chemoautotrophs. It can apply to both metals and nonmetals, in both the presence or absence of oxygen. In conditions lacking oxygen, sulfate-reducing bacteria are common, and they produce hydrogen sulfide, causing sulfide stress cracking. In the presence of oxygen, some bacteria directly oxidize iron to iron oxides and hydroxides, while other bacteria oxidize sulfur and produce sulfuric acid. Concentration cells can form in the deposits of corrosion products, causing and enhancing galvanic corrosion. High-temperature corrosion is chemical deterioration of a material (typically a metal) at very high temperatures. This nongalvanic form of corrosion can occur when a metal is subjected to a high-temperature atmosphere containing oxygen, sulfur, or other substances capable of oxidizing (or assisting the oxidation of) the metal. For example, materials used in aerospace, power generation, and automobile engines have to resist sustained periods at high temperatures, when they may be exposed to an atmosphere containing highly corrosive products of combustion. The products of high-temperature corrosion can potentially be turned to the engineer's advantage. The formation of oxides on stainless steels, for example, can provide a protective layer preventing further atmospheric attack, so that the material can be used for sustained periods at both ordinary and elevated temperatures in hostile conditions. Such high-temperature corrosion products, in the form of compacted oxide layer glazes, have also been shown to prevent or reduce wear during high-temperature sliding contact of metallic (or metallic and ceramic) surfaces. In 2002, the U.S. Federal Highway Administration released a study entitled, "Corrosion Costs and Preventive Strategies in the United States." It gave the direct costs associated with metallic corrosion in nearly every U.S. industry sector. It showed that for 1998, the total annual estimated direct cost of corrosion in the United States was approximately $276 billion (about 3.1 percent of the U.S. gross domestic product). Jones (1996) writes that electrochemical corrosion causes between $8 billion and $128 billion in economic damage per year in the United States alone, degrading structures, machines, and containers. Brimi, Marjorie A. Electrofinishing. New York: American Elsevier Publishing Company, Inc., 1965. NACE International. Corrosion Costs and Preventive Strategies in the United States. Retrieved June 16, 2017. Corrosion-doctors.org - Site dedicated to corrosion of all types. A Primer on Rust - Rust prevention and removal information. Article on "Anodising," Coatings and Fabrication magazine. NACE International - Professional society for corrosion engineers. This page was last modified on 30 June 2017, at 19:27.